The buttercream-colored brick and wood bungalow at 8 Brookside Park sits at the end of an enchanting cul-de-sac. WESTPORT — The town of Westport has 792 public and private roads totaling 189 miles within its borders. Some of those roads are majestic with their imposing mansions, while others are rustic and rural with updated antique farmhouses that serve as a reminder of the town’s agrarian past. Some of those roadways are worth traveling for their scenic beauty. Those who have driven or walked the length of Brookside Park (not to be confused with Brookside Place), off Richmondville Avenue, for holiday house and garden tours would characterize this private road as “enchanting.” This is a magical neighborhood year-round. An opportunity exists to be a part of this beguiling place. The buttercream-colored brick and wood bungalow at 8 Brookside Park is on the market. It sits at the end of the cul-de-sac. This five-room, 1,200-square-foot home is the perfect starter home or a home for empty nesters. It would make an ideal and inspiring residence and workplace for an artist or writer. Each of the six houses on this street have plaques revealing its name: Rosebrook Garden, The Farm House, The Dollhouse, The Nook, Corner Brook, and, this one is aptly called The Bungalow. The street and the exterior of the houses are illuminated by old fashioned gas lanterns. The magic is magnified this time of year when the houses and street in this in-town neighborhood are dressed in festive holiday lights and decorations. The close-knit residents celebrate the holidays with a progressive neighborhood dinner complete with holiday carolers strolling down the private cul-de-sac. The house was originally built in 1950 and was recently completely renovated. Inspiration for its transformation, interior design, and landscaping choices came from its listing agent, who also happens to be an Emmy Award-nominated television host, lifestyle expert, and author, Mar Jennings. In an upcoming episode of his television program “LIFE ON MAR’S: Home Makeover Show” Jennings will demonstrate how he elevated this structure from a modest house to a 21st century residence following his casual luxury design principles. “LIFE ON MAR’S: Creating Casual Luxury” is the title of one of his best-selling books. The episode will air on Sunday, Dec. 24, 1 pm, on ABC, WTNH-TV. “We took down walls, we gave it a cathedral ceiling, we stripped it of any wrong architectural details, and we tried to bring the interior to life by enhancing it with windows, skylights and proper lighting,” Jennings said. The house does not sacrifice style for size, and despite its size it feels spacious and features many of the amenities found in houses three times its square footage. Inside, the living room has a gas log fireplace and beams. The kitchen features a vaulted ceiling with two skylights, a glass mini-subway tile backsplash, and oak flooring. Its high-end appliances include a Viking four-burner range and Miele dishwasher. The master bedroom suite has a full bath with a marble floor and a laundry room tucked away behind a barn door. There is a second bedroom and another bath; both baths have new heated floors with attractively patterned marble tiles. Open to the living room is a sunroom, which has walls of windows and a door to a bluestone patio on the side of the house by the brook, from which the street gets its name. “We removed the aluminum fencing along the brook to enhance the water view and visually extend the line of the property,” said Yvonne O’Kane, a lifestyle Realtor who worked with Jennings on the transformation of The Bungalow. This 0.2-acre level, secluded, and peaceful lot is beautifully landscaped and the house lends itself to adornment in every season with different foliage in its window boxes. A cupola sits atop the one-car attached garage, which provides access to the basement where there are 1,000 square feet of endless storage possibilities. The house is located in the Westport Downtown Village section and it is convenient to shops, restaurants and the Merritt Parkway about a mile away. 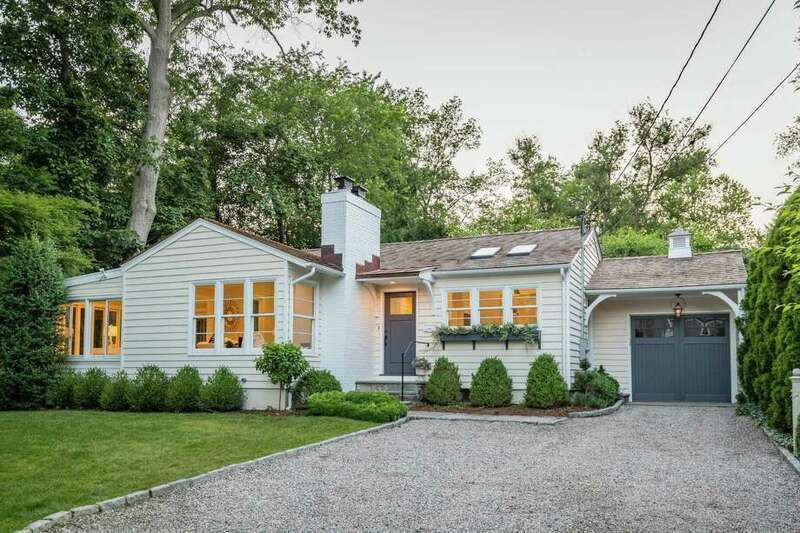 For more information or to set up an appointment to see the house contact Mar Jennings of Douglas Elliman of Connecticut at 203-227-4065 or mar@marjennings.com.